U.S. Secretary of State Mike Pompeo says he's optimistic that denunclearisation of North Korea can be achieved. He was speaking at a summit of South East Asian nations in Singapore. His remarks come after a UN report on Friday claiming that Pyongyang has not halted its nuclear and missile programme. President Trump met Kim Jong-un in Singapore in June and the two leaders agreed to work towards denuclearisation but did not spell out exactly what it would look like. 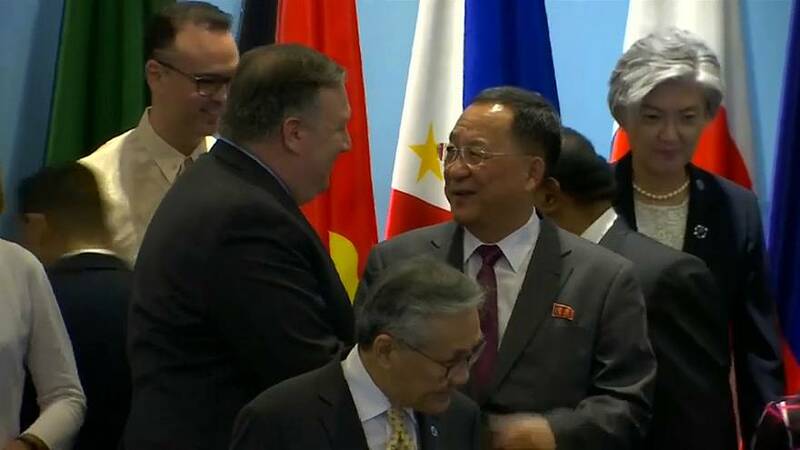 "The process of achieving denuclearisation of the North Korean peninsula is one that I think we have all known will take some time," Pompeo told delegates, "but I must say from my meetings here, the world is united in seeing this achieved. There has not been a single country that hasn't thanked the United States for its efforts in moving the world towards the possibility of achieving this end state goal." Pyongyang is currently subject to a wide range of international sanctions over its nuclear programme and missile tests. Aside from North Korea, U.S China trade relations are of concern to the world. With that in mind, Pompeo also met with the Chinese government's top diplomat, State Councillor Wang Yi. Earlier this week Washington said it was considering higher tariffs on 200bn dollars' worth of Chinese goods. Beijing has responded by saying it will levy new tariffs on over 5,000 American products. Is there now a bromance between North Korea's Kim and Trump?